This photograph was taken in the spring of 1952 when the garage and store complex was owned by Bob Fairman. It had quite a history in Trafalgar Township prior to this, most notably being opened prior to 1827 as a hotel, tavern and post office by Ephraim Post. It was located on the south-west corner of Trafalgar Road (Seventh Line) and Dundas Street. The Trafalgar Hall was on the south-east corner. The stores of the Dent and the Bradley families were on the north-west corner of the intersection. The Post Inn was opened by the Post family on the south-west corner of Dundas Street and 7th Line (which is now called Trafalgar Road), or on Lot 13 Concession 1 SDS, before 1827. The Inn was first run by the father of the Ephraim Post in the photograph here, and his mother, Elizabeth (Lyon). It was enlarged by a two-story addition across the front when son Hiram took it over in 1841. 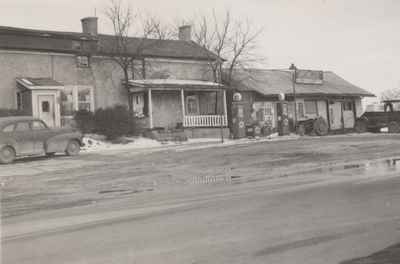 The old two-storey Inn eventually had a gas bar, a general store, and the addition of an ice cream booth made it a destination for area resident drivers until the complex was torn down in the 1960's. The Trafalgar Township Historical Society has several photographs of the Inn in this internet collection, as it was in the 1950's-1960's with the two storey building, the gas bar and ice cream booth. Ephraim Post, click on the link under the photograph in this record, brother of Hiram and son of Ephraim the inn keeper, is listed in census documents as a farmer. Ephraim married Jane Milles, 1817-1867. Their children were Thompson Egbert Smith Post, Anna Elizabeth (called Annie), Henry Edmont, Harry, Helena Josephine and Thomas E. Post. Ephraim and his second wife, Sarah Elizabeth Derby had two daughters; Marion Derby and Blanche Emily. The 1857 Tremaine's map shows the property was owned by Benjamin Thompson. James Young was running the Inn in 1876 when George Baker took it over. Mr. Baker remained until his death.